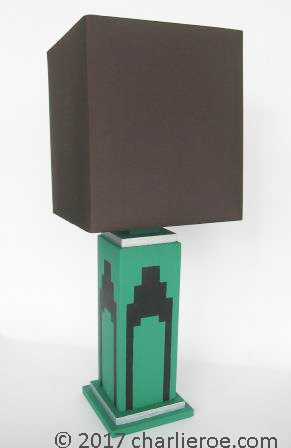 This new lamp design forms part of a new range of Deco style lamp bases, drawing on the influence of Paul Frankl's Skyscraper style. There are several colour versions shown below. We're still adding to the options & colours for these.. The stepped base is pure Deco, with the overall shape & massing echoing a skyscraper. These lamps are all made to order. 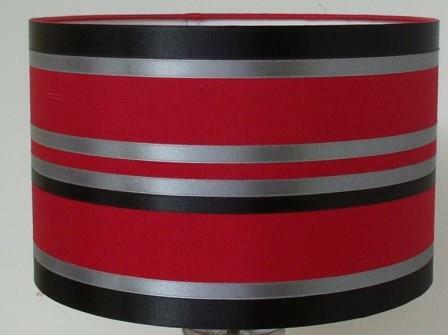 We don't supply lamp shades to go with the lamp, as this is personal taste & most customers prefer to choose their own. We've shown all these lamps with the same shade, so it's easy to judge how the designs compare against each other. Supplied with a 2.5M cable. Cable colours are available in white, black, gold, etc; let us know what you would prefer. 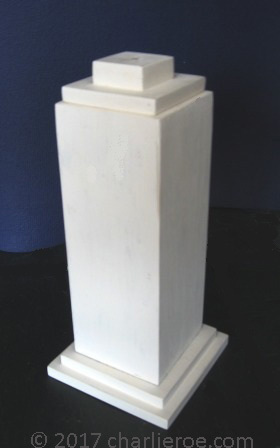 Base ht approx 30cm. Made to order. The colour for this lamp was influenced by a lacquered Donald Deskey suite of furniture, with silver streamlining details. 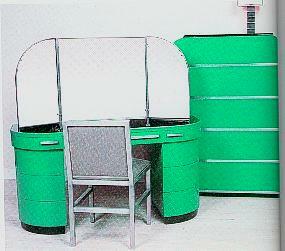 This is another version of the Deskey furniture colouring, this time in green with streamlining lines. The colour is almost verdigris, a popular Deco finish. 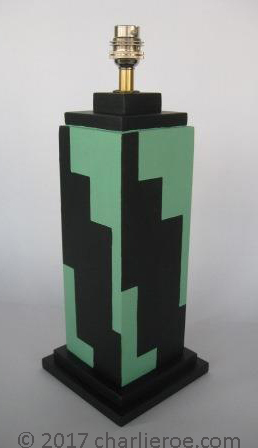 This version of the lamp is based on some of Paul Frankl's Skyscraper range of furniture, in green with silver detailing. It is a quite simple & strong profile, probably as Frankl would have preferred. 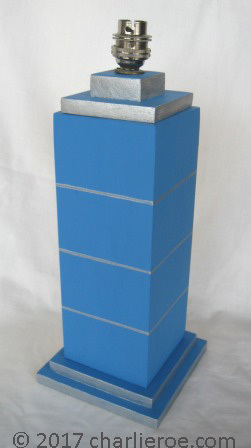 This is a variation of the Paul Frankl's lamp above, with added Skyscraper design on the sides. 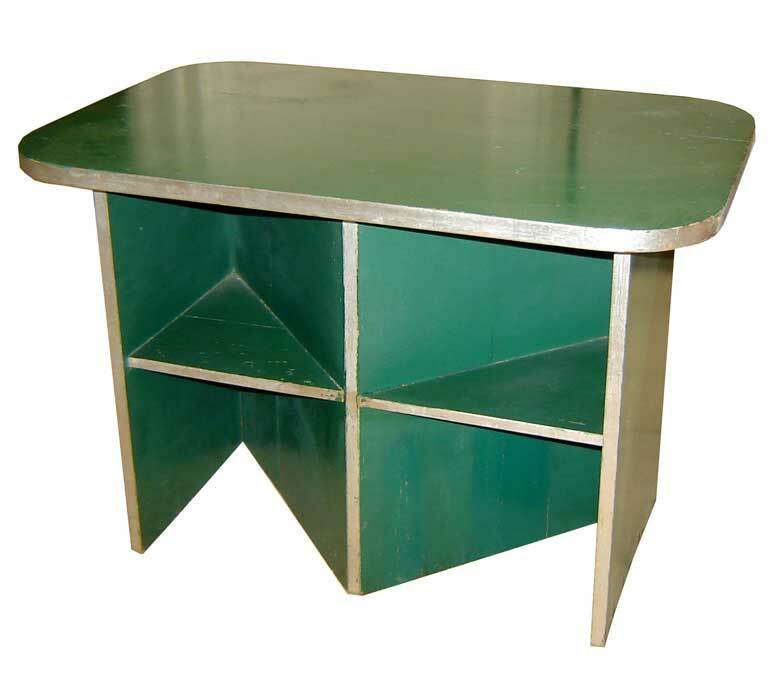 The relatively plain original is suddenly a striking Deco piece, with the stepped designs emphasising the stepped shape. It could be finished in any colour you like, as made to order. This stunning design was based on an original Rene Lalique piece. 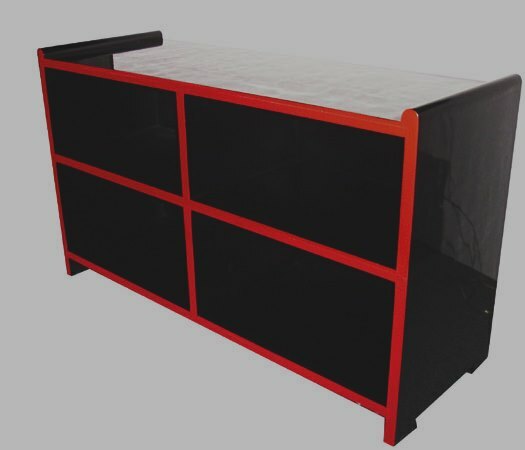 Painted black with silver patterns & red bands. The original didn't have the red bands top & bottom, but it really lifted the whole design using the red. Made to order. The colouring of this lamp version is based on some of KEM Weber's painted furniture, as shown with the desk above RH. The desk clearly shows Weber's use of streamlines, which is picked up with the lamp. Maybe you prefer your Deco a little more 'Shabby Chic'? The photo bottom right shows an aged & distressed version of the lamp; makes it look like it could have been an original. 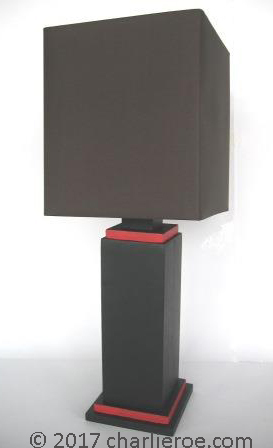 This dramatic black lamp was inspired by Paul Frankl's Skyscraper furniture, specifically his black & red furniture. The low bookcase above right shows this clearly. You could add a really dramtic shade such as the one above right. Another strong Deco lamp design. 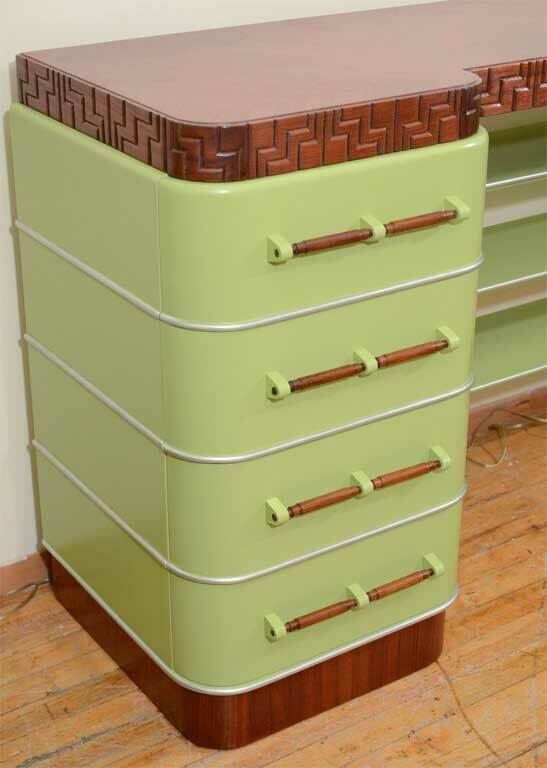 The idea for this design came from a piece of zigzag decoration from 1930. The zigzag stepped shape matches the stepped shape of the lamp of itself. Could be painted any colour combination you want, as made to order. If you think some of the lamp designs look too new, then we can distress them to look like they've seen 80 years of use! It is a nervous moment when you take a newly finished piece and then just abuse it to make it look more worn; but it does give these pieces an air of authenticity. Distressing a piece can be either done gently to heavily & all points in between. The way this version was aged is probably about right. The influence of Paul Frankl couldn't be any clearer for this lamp design. Frankl's painted cabinet, bottom left above, is such a striking piece today, imagine the impact it must have made in c1930! 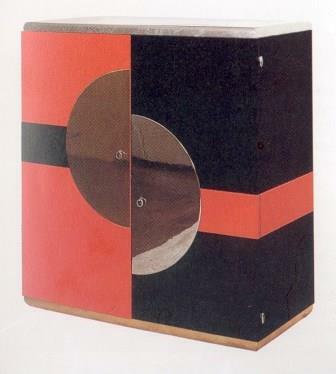 Many Frankl pieces pieces were painted in black & red, so it seemed we should pick up on this for a lamp design or two. The 2 half circles can be painted in a metallic silver (which gives a nice alumnium look to them) or we could silver leaf them (as Frankl often used silver leaf). Made to order. The initial version was painted cream, which is a good colour to start with. It's quite plain, but some people prefer that, more subtle. With a nice shade it would look good. The black version is more dramatic. These can be painted any colour(s) you like. Art Deco lamps Contact Us for a quote or more information.